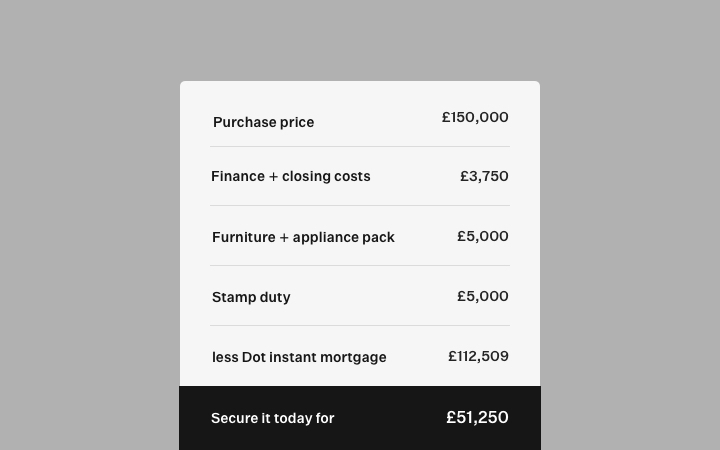 Dot, a new U.K. startup de-cloaking today, aims to make it easy to invest in property without the hassle of taking out a traditional ‘buy to let’ mortgage. The company is founded by Gray Stern, who previously co-founded London-based Buy to Let mortgage lender Landbay, and so knows at least a thing or two about investing in property. Namely, that it doesn’t need to be as arduous as it currently is. In fact, Dot’s headline draw is that it makes property ownership a one-click affair via the “Dot Button” it wants to embed on property listings sites, including estate agents and property developers. Under the hood of the offering is what the startup describes as a “point-of-sale finance and management solution” that can be wrapped around any property that meets Dot’s lending criteria. If you want to purchase the property as an investment, you simply click the button, pay the required deposit, and Dot will acquire and manage the property on your behalf, advancing 70 percent of the purchase price in the form of its pre-approved or “instant mortgage”. In addition, the property is furnished and Dot takes out buildings, contents and rent guarantee insurance. After those expenses, you receive monthly rent from the property, minus management fees and interest paid on your Dot mortgage. Technically, once the property is purchased it is moved into a passive investment structure: an SPV known as a “Dot Container”. This structure holds the asset on your behalf (you effectively become the SPV’s beneficial owner/shareholder). When you’re ready to sell, in theory a Dot Container can move from owner to owner without conveyancing, and can be refinanced without requiring new mortgage documents (via Dot Platform, Dot’s mortgage marketplace). Alternatively, the property can be put on the open market. Either way, as the SPV’s sole shareholder, you benefit from any increase in the valuation of the property, less the remaining balance of the mortgage. 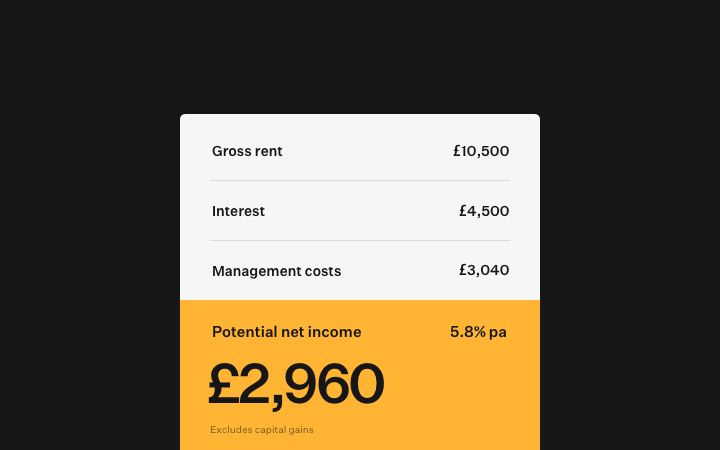 “Dot enables anyone with a 30 percent deposit to become a professional property investor instantly, with none of the hassle of being a landlord,” explains Stern. “We do this by providing U.K. and U.S. estate agents and property developers with a pre-approved finance and management solution — a Dot Container — that can hold any suitable property. The agent can then offer Dot as a payment option (via the embedded Dot Button), turning their previously static listings into turnkey investments that anyone, anywhere can buy online on a fully financed and managed basis. “Every Dot Container comes complete with a pre-approved mortgage, insurance, legal/conveyancing, tax compliance and reporting, lettings and management, furnishings and everything else required to turn that property into a compliant, well-managed and good-looking rental home. Dot takes care of the entire end-to-end process… and because we are lending a large portion of the total cost we have a vested interest in managing your property well”. Stern says that Dot differs from property crowd-investing type platforms, such as Property Partner or Bricklane, which typically let you buy shares in a portion of a property or a property portfolio and aren’t coupled with a financing option. “Dot’s solution is for sole investors or couples looking to build property portfolios that they control, we do not offer fractional ownership,” he adds. “Our clients own the asset and while they give Dot management rights, they can also remove Dot at any time, sell at any time, refinance their loans at any time. Dot’s challenge is to make our offer sufficiently compelling that they won’t want to”. Meanwhile, Dot has raised $1.5 million in a pre-seed round from Stage Dot O, an L.A.-based venture-build firm run by Roofstock co-founder Devin Wade and ex hedge fund manager Mike Self.